Additional Info: Bookings are taken for 7 days (Sat-Sat or Fri-Fri), 4 days (Mon-Fri) or 3 days (Fri-Mon). I am happy to discuss flexibility around the number of nights stay, dates and prices. Please phone or email me for availability and prices. 2 night stays considered but you are asked to bring your own linen. £75.00 deposit required to secure your holiday. £75.00 deposit (non-refundable) is required to secure your booking with final payment required 8 weeks from date of commencement of your holiday. Payments can be made by cheque or online banking. 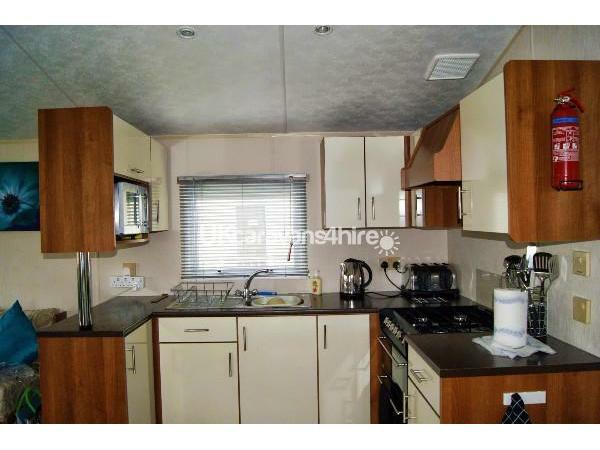 With an open plan living area, which has a fully fitted kitchen, including family size gas cooker, microwave, fridge, toaster, kettle, iron, ironing board, crockery, cutlery, pots and pans and a vax sweeper. The dining area is adjacent to the kitchen. The lounge area consists of 2 double sofas, full size TV, blu-ray DVD player, remote control electric fire. A pull-out double bed is stored under one of the sofas in the lounge. 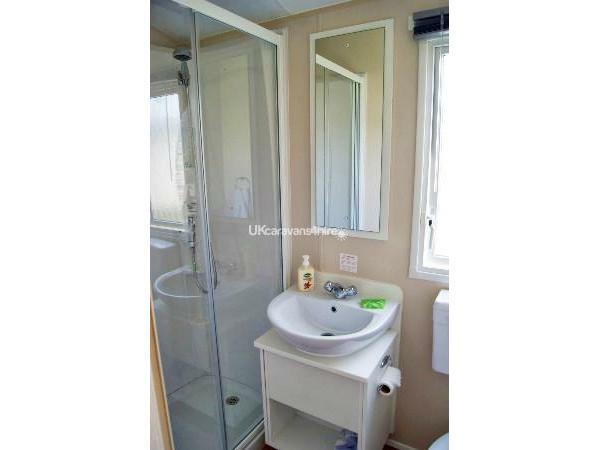 The bathroom consists of separate shower cubicle, toilet and wash basin. 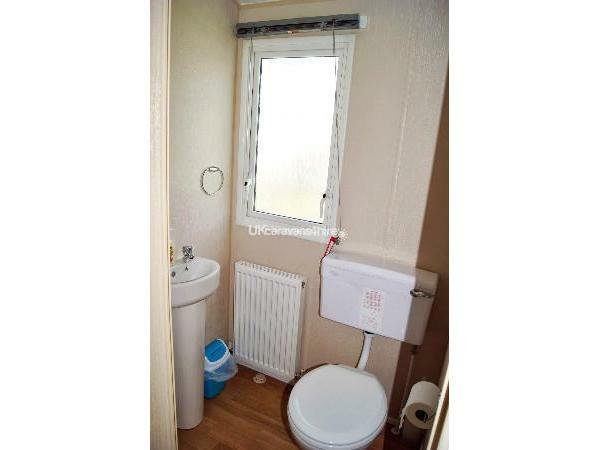 With a further cloakroom with toilet and basin. Veranda with table and chairs. Lockable gated access to the veranda to help increase child safety. 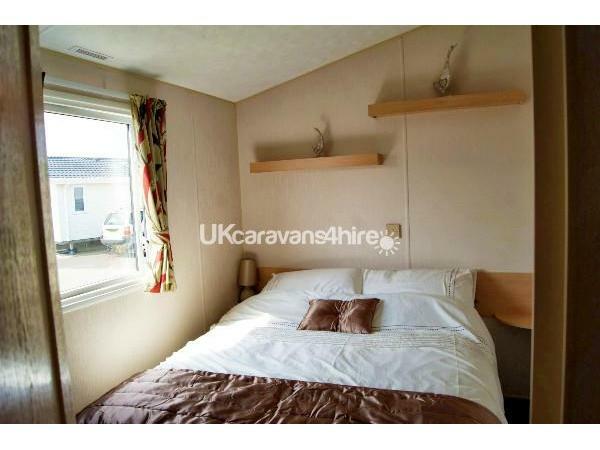 The caravan is of a very high standard and very well equipped with everything you need for a relaxing holiday. There is parking for 2 cars with its own parking bay. Bed linen is provided for stays of 3 nights or more. 2 night stays considered but you are asked to bring your own linen. A non refundable deposit of £75 will be required at the time of booking to secure your holiday, with the balance being due 8 weeks before your holiday starts. Please email or telephone for latest availability and prices. A £50 refundable security deposit is required on all bookings which will be refunded within 7 days after departure providing the caravan is left in the same condition as when you arrive in a clean and tidy condition and no damage. 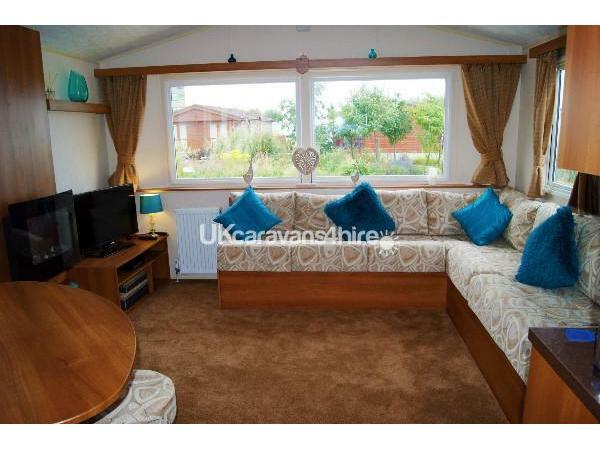 This caravan is situated on a quiet upgraded part of Manor Park with the lounge area of the caravan over looking grass and a small shrubbery area consisting of plants and small trees. Wifi has been installed throughout the Park which enables wifi to all caravans, this is provided via Wifinity on a 'Pay as you go" basis. The fee for wifi is dependent on the length of your stay and the number if appliances you wish to register. Wifi is available in the clubhouse free of charge. Manor Park Holiday Park has received Trip Advisor's Certificate of Excellence for the second consecutive year in 2016. 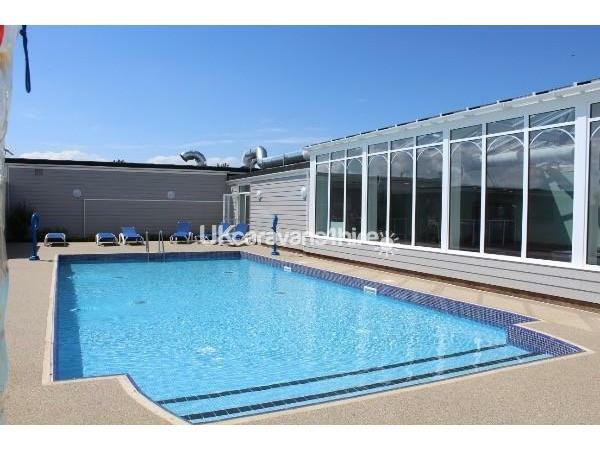 Manor Park Holiday village facilities include a club house which is a 5-10 minute stroll from the caravan. An adventure playground, Kids Club, restaurant, entertainment throughout the day during high season (a quieter programme in low season) and a launderette, plus a touring caravan site. There is a large Tesco store opposite the site. A ten minute walk to town centre and a five minute walk to the beach from the site entrance. Manor Park is one of the premier parks in the area. The town has a fairground, shops, bars, restaurants, leisure centre, swimming pool, Sea-Life Centre, Crazy Golf, a Golf Course, arcades, ten pin bowling, theatre, chemist, post office. In nearby Heacham there is Norfolk Lavender with a children's play-barn. Places such as Royal Sandringham Estate, Holkham Hall, Felbrigg Hall, Blickling Hall and Castle Rising are not far away. This is also Snettisham Wildlife Park, RSPB Reserves at Snettisham and Titchwell and Pensthorpe if you are a nature lover. Local buses to King's Lynn stop outside the park gates. There is also the local Coast Hopper bus service which stops outside and can be used to visit the coastal towns and villages up to Cromer, stopping at Wells-Next-The-Sea and Sheringham amongst others. Concessionary passes are accepted on these buses. Booking taken from Fri-Fri, Sat-Sat, Mon-Fri or Fri-Mon. 2 night stays are available but linen is not provided. 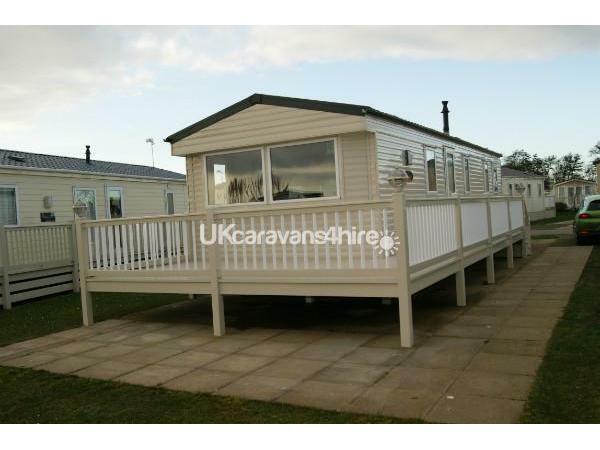 This caravan can be rented 11 months of the year including Christmas and New Year. The site closes for a short period during mid January - mid February. 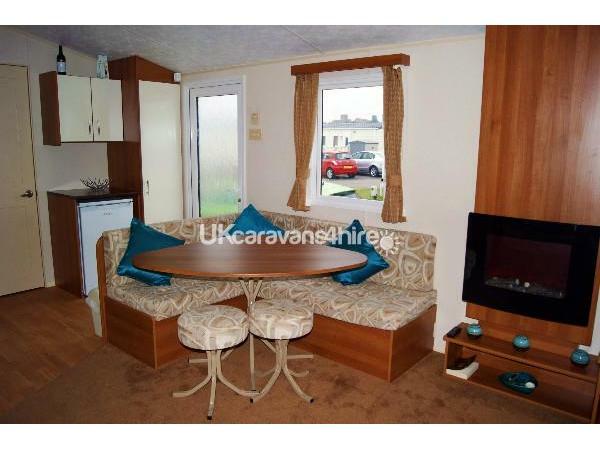 "Beautiful caravan, very clean and comfortable. Lovely holiday. Would Recommend". "The best equipped caravan ever. Everything has been though of. Will definitely recommend'. 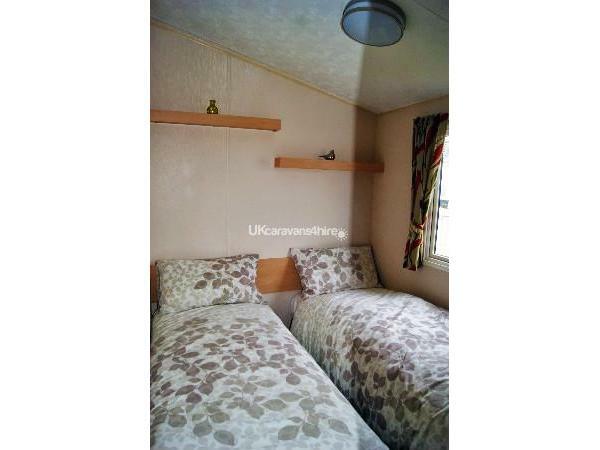 "A clean and well equipped caravan. A pleasure to move into without having to clean first! Not sure who enjoyed break most, us or the ducks. We will be back'. 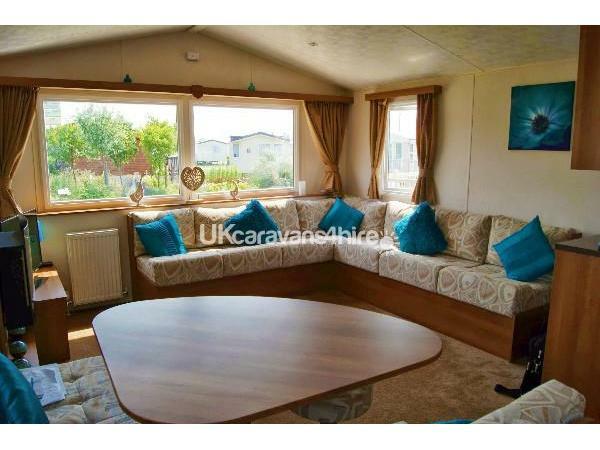 "Best caravan we have had, great facilities, very clean and very homely. Would love to come back. *Kids give 10 out of 10*". "Got to be one of the best accommodations we have stayed in. Very clean, has everything we needed. Lovely site and very good entertainment for all ages. Would recommend this caravan 100%. Would definitely come back here again". "Great caravan, well kept. Couldn't ask for any better. Will call you again Jane". "Lovely private caravan. Great holiday, well equipped van. Thanks Jane". "A veritable home from home. Well equipped and very comfortable, its so nice someone has taken time and trouble to think what people might need. We hope to be back next year. Thank you". 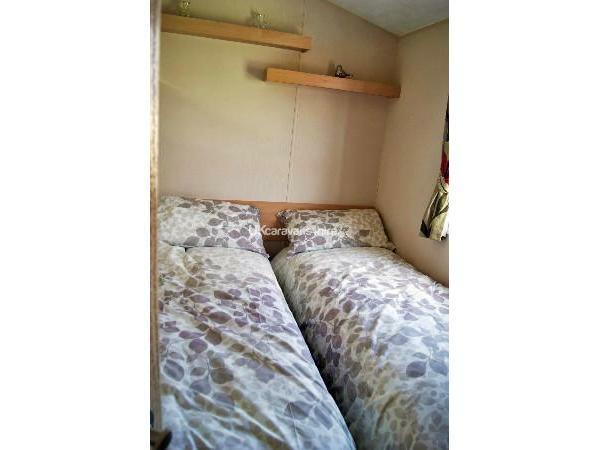 "Lovely caravan, very clean and comfortable. Enjoyed our stay. Will definitely come again". Additional Info: Sky Sports on big screen, pool table - Entertainment passes available. 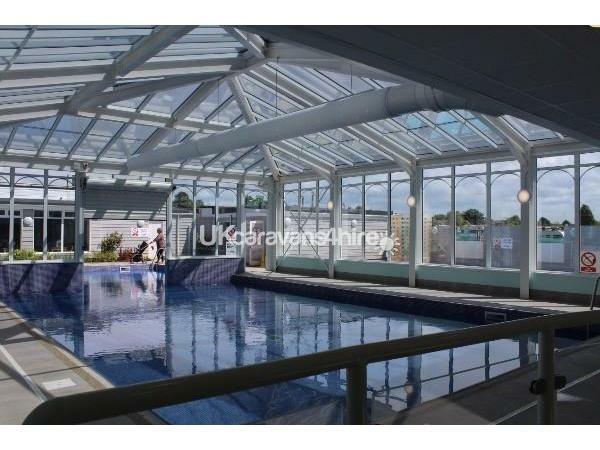 A newly refurbished indoor/outdoor pool and toddler pool is now open. Wifi if now available throughout the park, pay as you go, through Wifinity. It is still available free of charge in the Park complex. Kiddies club, Entertainment and Restaurant.